Stacy Alves brings 10 years of customer service experience to our team. She has her bachelor’s degree in psychology from the University of South Florida. Her degree has helped shape her communication style and lets her connect a with wide variety of people. Since high school, she has been fascinated with how the mind operates and plans to start graduate school this year. 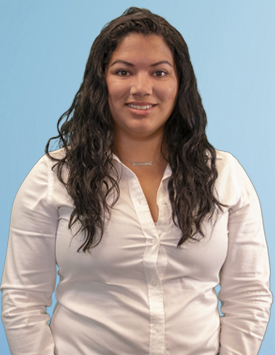 She thoroughly enjoys interacting with customers and wants clients to know she will work diligently to make their needs happen. The key to success is to have clear communication and understanding with our clients. She prides herself in being a piece to the puzzle that makes your business grow and flourish. I just wanted to drop you both a note to say thank you for helping me out recently. Our correspondence with the CDFI grant coordinator indicates that everything related to our SAM account has been resolved. No doubt thanks to you guys. We can’t tell you how much we have appreciated your assistance! Thank you so much, Stacy! Nina got everything squared away and we are good to go now! Thanks so much for your friendliness and professionalism, and for all your help. You made it so easy! I highly recommend SAM, we were a little skeptical because of the price but after finally deciding to go with it my agent is very helpful. I love her response time. Great move for Integrative Health!!! !